The Tower Tarot card is another Major Arcana card that most people do not like to see in their readings (I wrote about the Frequently Maligned Death Tarot Card last week). I personally think it is given a bad rap as it promotes change and sometimes forces outcomes to change for the better. But then again, one of the reasons we don’t like seeing this card is no one is particularly fond of change. Especially the kind of change that blind sides you or completely upends your life and that is exactly what the Tower card represents. With Mars as its ruling planet, the Tower is a card about war, a war between the structures of lies and the lightning flash of truth. The Tower is one of the clearest cards when it comes to meaning. False structures, false institutions, false beliefs are going to come (or have already come) tumbling down, suddenly, violently and all at once. This sort of prediction can scare anyone, especially as the one you’re reading for likely does not know that something is false. It is usually about getting a very rude awakening. Shaken up, torn down, blown asunder. Nothing built on a lie, on falsehoods, can remain standing for long. Better for it to come down so that it can be rebuilt on truth-or not rebuilt at all, whichever is for the greater good. This rude awakening is not going to be pleasant or painless or easy, but it will be for the best in the end. The Tower often shows up when something has come to a completion but the seeker is too invested to be able to let it go. In a love reading, the seeker might be unable to handle the realities of the relationship they are in. They might not be very compatible with their love interest or they themselves have some behavior they are unable to face. When reality hits it can come as a shock but the relationship might even benefit once the emotional turmoil has been dealt with. When dealt inverted (upside down), it can also symbolize that things are starting to calm down from the unsuspecting upset. 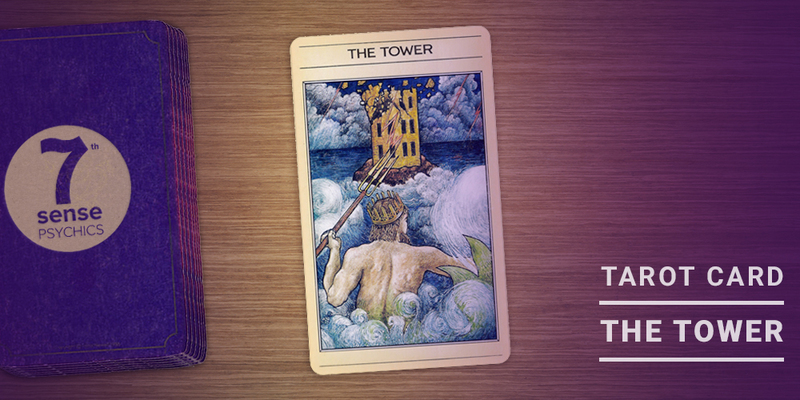 The Tower shows up in our love readings when we need to face our emotional fears and pain. If you are in a relationship and the Tower shows up you might find out something about your partner that shocks you. You might even realize you are not very compatible. Most likely you are arguing and stirring emotional pain up in each other. You can either deal with your issues and grow as a couple, or you can separate to find out what you need. If you are single and the Tower shows up in a reading you might have to face some truth about why love seems to elude you. In most cases it is fear of abandonment. The message is to let go of your fear of rejection and you will find that the dating scene has a lot to offer and that potential love interest will show up. As challenging as this card may seem to be, the end game of getting this card in a reading is to force change for the better. It is what I call one of the ‘expansion’ cards in the Tarot deck and should not always be seen as a bad thing. Whether you have been praying for change or needed the push, the Tower portends of a drastic realization of truth. Inevitably, once the dust settles from the awakening or change, what is put back together is stronger, wiser, more willing to go with the flow and a realization that more self-love was needed. This card was meant for me .. I just left a toxic relationship and my biggest fear is abdomen .. this is why I stayed in the relationship but I have to trust that I deserve better and better will come my way ..